ATLANTA, Apr. 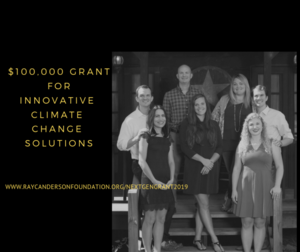 10 /CSRwire/ - The NextGen Committee of the Ray C. Anderson Foundation has issued a call for proposals for one $100,000 grant to fund work in the 2020 calendar year for new or existing programs that will help to reduce global warming, whether through direct carbon avoidance, climate communication, climate education, industry engagement, or otherwise. The Ray C. Anderson Foundation is a private family foundation committed to advancing the legacy of its namesake by supporting environmental sustainability initiatives. Ray’s five grandchildren, along with their spouses, comprise the NextGen Committee of the Foundation, which makes recommendations to the Board of Trustees for worthwhile grants and initiatives. In 2018, the NextGen Committee decided to focus its philanthropic efforts on programs that help to reverse global warming and they awarded a $90,000 grant to Second Nature. Those interested in applying for the grant should visit the grant web page to review the proposal guidelines and submit their proposal.